I have had a canker sore for ten days. I’ve never had one before but I hear they take a while to heal. But, now my sister has me worried. She said her best friend had what she thought was a canker sore, but it ended up being oral cancer. Is that really possible or is my sister just trying to freak me out? I tend to avoid the dentist, but this may send me to one. Your sister is not pulling your leg. Oral cancer can be mistaken for a canker sore. So, how can you tell? I wouldn’t rush off to the emergency dentist just quite yet. They can take up to two weeks to heal. It’s no fun and they’re a bit on the painful side. If you go much past two weeks and it’s not healed, then a trip to the dentist would be in order. The trick to a canker sore is getting by until it heals. The first thing I’d start doing is start using a rinse which will kill germs in order to help move the healing along. You can purchase Listerine, which works great or make a homemade rinse made of peroxide and water. Just mix it in a 1:1 ratio. Other than that, all you can do is use some type of numbing medication. For canker sores, they come in two varieties The first is a pad that’s supposed to adhere to the sore and keep it covered to cut down on the pain. Truthfully, our mouths are so moist these are hard to keep on. Your better option would be the gel that comes out of a tube. These sometimes have an antiseptic in their ingredients which helps prevent it from infection. You mentioned you tend to avoid going to the dentist. My experience has been those who avoid the dentist tend to do it for one of two reasons (sometimes both). First, is financial. Dental care costs money. It’s not exactly like spending money on a movie or restaurant where you get to have fun. You’re spending money to have someone stick pointy instruments into your mouth. Because of that, some people don’t think of it as a priority. Others really struggle to come up with the money for a check-up. If you’re the latter, start by trying for one check-up a year. It’s better than nothing and will actually save you money in the long run. For instance, with regular dental care, your dentist can tell you quite early when you’re developing decay. A simple filling costs hundreds less than a root canal treatment which you’ll need if the decay progresses too far. It costs thousands less than if you wait so long that the tooth can’t be saved. Then you’re talking about a tooth extraction and a tooth replacement, such as dental implants (which also means surgery). “An ounce of prevention is worth a pound of cure” is a very true statement. Also, you should know that dentists will always check you for signs of oral cancer at your checkups. The second reason people avoid tend to avoid the dentist is fear. This generally has its seeded beginning from a bad experience they had in their childhood. Now that they’re an adult and there’s no one to force them into going, it’s easier to skip. If that’s your situation, I’m about to change your life. I’d like you to try an appointment with a sedation dentist. They can give you a simple pill to take which completely relaxes you. You still have all your ability to talk and function if you want to, but you’re so relaxed you could actually sleep through the entire procedure. In fact, most patients do sleep through it. This blog is brought to you by Dr. David Potts. Three months ago I had a crown done. I’ve been back every week since then trying to get it adjusted because it’s hurt from the beginning. Today, though, it broke off and a piece of it shattered off. I’ve gotten to the point where I don’t trust the dentist who did the crown, so I decided to try an emergency dentist. The great thing was they got me in that day. I just wanted them to re-bond it on. I didn’t even care about the chunk that broke off because the tooth isn’t visible. But, the emergency dentist refused. He insists the crown has to be entirely replaced. Is he just doing this because it’s someone else’s crown? I don’t know the dentist, so I definitely couldn’t tell you his motive. What I can tell you is something is seriously wrong with that crown and it is more likely that it actually does need replacing. Even if the broken piece isn’t visible, it is broken. You’ll have rough, possibly even jagged, edges that can cut you. More than likely, there’s a tiny opening somewhere that material can get into the crown. That will lead to decay and then instead of needing a new crown, you’ll need a tooth extraction and dental implant to replace the tooth. A porcelain crown should last a minimum of five years. Yours didn’t even make it half a year. The first thing you can do is go back to the original dentist and have him replace the crown free of charge. That’s a perfectly reasonable demand because your crown is not functional. I understand that you don’t trust the dentist who did the crown. So that may not be an option you’re too keen on. Aside from having him do another crown, you have two choices. The first is just pay the emergency dentist to create a new crown for you. Crowns aren’t a difficult, advanced procedure. Every general dentist knows how to do one (Well, maybe except your dentist). 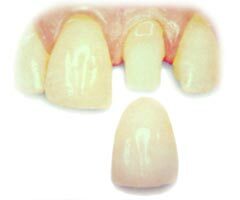 If the tooth were visible, you would need to make sure the dentist was an artistic cosmetic dentist. But, you said the tooth isn’t visible so just a decently attractive functional crown will be fine. If paying for a second crown is a hardship, you are within your rights to ask your dentist for a refund on the dysfunctional crown he provided. Even if it’s not a hardship to pay for the second crown, you should ask for a refund out of principle. If he doesn’t do even minimally adequate work he needs to be held accountable. I know it’s been a frustrating experience for you but hopefully, a properly made crown will take some of this stress away. I’m certain you’ll at least feel better physically. Are There Metal-Free Dental Implants?